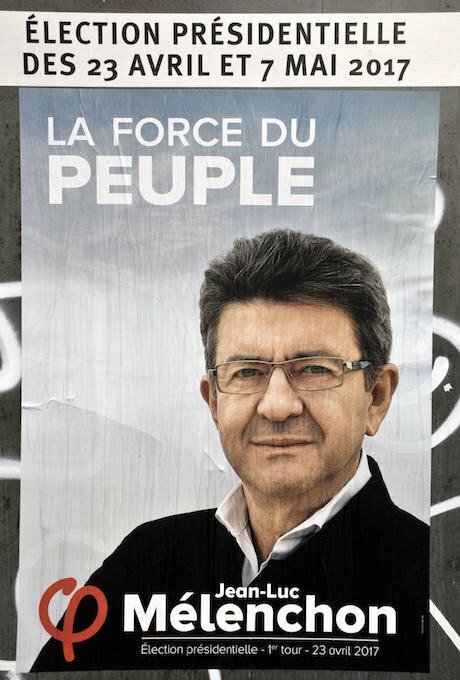 Jean-Luc Mélenchon, campaign poster. Apaydin Alain/Press Association. All rights reserved. Phillipe Marlière introduced his blow by blow account of the 2012 French presidential elections thus: 'Charles de Gaulle once said that the French presidential election was “an encounter between the nation and a man” (sic). There is much more to it though. I invite you to follow my journey: analysis of results, as well as personal thoughts on candidates, debates, the media, opinion polls and the “mood” of French voters.' Now he is back, and with the burning question of the hour: what is behind the incredible rise of Jean-Luc Mélenchon? How far will it go? With less than a week to go before the first round of the 2017 French presidential election, the latest twist in a long – very long – list of twists and turns, has been the late surge of Jean-Luc Mélenchon, the leader of France Insoumise (Unbowed France). Until March 20, the former Left Front Candidate was trailing Benoît Hamon in fifth position. According to the latest opinion polls, Mélenchon is in third position ahead of François Fillon, the conservative candidate. What is more, he is now within touching distance of Emmanuel Macron, an independent centrist candidate, and Marine Le Pen for the extreme right’s Front National. Both Macron and Le Pen have been losing support over the past weeks. The momentum is clearly with Mélenchon. Mélenchon could make it to the second round next week, and if opposed to Le Pen, he would indeed be the clear favourite to become the next president. What an astonishing change of fortune for a candidate who last February was stuck at less than 10% in the polls while Hamon, the victor of the centre left primary election, registered a promising 17%. How to explain such a late surge? There are internal and external factors. Mélenchon, of all candidates, is certainly the better prepared. He was a candidate for the Left Front in 2012, and since then has been a vocal opponent of the unpopular socialist government. He declared his candidacy one and a half years ago (he had been thinking about running long before that). Decisively, he chose to go it alone this time and do things his own way: he would not be the candidate of the radical left, but the self-appointed “champion of the people”. His traditional allies (the Communist party and other small left-wing parties) would play no major role in his campaign this time. The red flags are no longer welcome at his mass rallies and have been replaced by tricolour flags. The Internationale is no longer sung at the end of meetings, and the Marseillaise is now the new common anthem. In true populist fashion – a notion which Mélenchon positively accepts – the “Unbowed leader” no longer attempts to gather together all constituencies of the Left, but he aims to “build a people”. In other words, he follows a cross-class tactic and hopes to capture votes from all kinds of social and demographic backgrounds. Mélenchon met several times with Chantal Mouffe and the late Ernesto Laclau, both academic experts on populism. They discussed “left-wing populism”, a strategy designed to fight back against the rise of “right-wing populism” embodied in France by the Front National. Jean-Luc Mélenchon believes that the Left is dying because it has forgotten that politics is about conflicts, passion and symbolism. “Third Way politics”, he reckons, by adjusting to the demands of globalised finance capitalism, has committed political suicide. Across Europe, ordinary workers are deserting social democratic parties en masse. Hence the necessity to re-engage with social justice-related rhetoric and politics, but also to recapture themes which have arguably been ‘abandoned’ to the right and the far-right, notably patriotism. Although it is a new approach on the French left, this tactic was put into practice with relative success in Spain by Podemos. 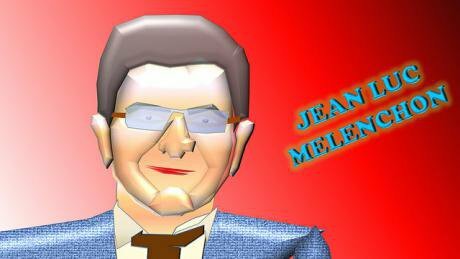 As the campaign progresses, Mélenchon is less and less perceived as a ‘radical left’ candidate. This is clearly part of a plan to come across as a non-divisive figure who reaches out to voters from both the left and right. He has lately registered more support from moderate socialist voters, but he is also appealing to people who initially intended to vote for Macron or Le Pen. After rediscovering his radical roots in 2008 when he quit the Parti Socialiste (PS) in which he had been a party official for 35 years, Mélenchon has yet again reinvented himself as a pro-environmentalist grandfather figure who waves the tricolour flag. Environmental issues bind people across social classes and generations, the father figure (like Mitterrand, his political hero) tends to project an image of unity and appeasement (he appears much calmer on television and has stopped picking fights with journalists) and the tricolour flag is a stringent sign of his conversion to populist politics (although he was always a republican patriot). Mélenchon’s blatant patriotism – for some nationalism – has raised a few eyebrows on the left. Furthermore, he is an old-fashioned republican who praises the “French model of citizenship”. This communitarian conception of integration relies on a discourse which abstractly posits the equality of all, irrespective of social, ethnic and gender backgrounds; a conception of citizenship which is shared by a majority of voters, including conservative and Front National ones. Mélenchon’s efforts to triangulate right-wing politics while opposing the FN’s “ethnicization” of politics have ultimately paid off. His obstinate opposition to the “neoliberal drift” of Hollande and Valls in power is certainly appreciated by a majority of the public. He has also captured the anti-establishment zeitgeist in the country. He early on understood that volatile and angry voters wanted to “kick the incumbents out”. But, in the end, those factors may have played a marginal role in Mélenchon’s recent success. JEAN LUC MELENCHON 201. Flickr/Richard Grandmorin. Some rights reserved. Mélenchon’s spectacular rise was also boosted by the mediocrity of his opponents: Le Pen who peaked in the polls early is not having a good campaign. There have been corruption allegations against her. Fillon was arguably on course to win this election last December until the French realised that he had a neo-Thatcherite economic agenda. Then multiple corruption allegations involving personal gain for members of his own family have destroyed his electoral prospects. This being said, and rather amazingly, Fillon is resilient and cannot be written off as we speak. Macron is a largely untested politician and the left, in general, scorns the former trader who is seen as a French Tony Blair. But the real reasons for Mélenchon’s ascendency is Hamon’s dramatic collapse in the polls. A young modern leftist, esteemed on the left in general, Hamon won the primary pledging to break with Hollande’s and Valls’s mix of economically liberal reforms (e.g. Labour law) and politically illiberal measures (e.g. the plan to revoke the citizenship of dual-nationality terrorists). Like Mélenchon’s, Hamon’s programme is broadly speaking of a left-wing social democratic nature. He is also interested in green issues, talks about gender and ethnic-related issues. He thought that as a candidate of a more central party on the left, he would manage to syphon off Mélenchon’s votes as the electorate would soon realise that it would be a more effective choice to support Hamon to defeat Le Pen and Fillon, than the more radical Mélenchon. But Hamon (and all commentators – myself included) underestimated two things: after five years in office the PS is now a totally contaminated brand. Moreover, party officials soon broke ranks and pledged their support for Macron although he is not a PS member. They did so because they belong to the neoliberal right-wing of the party and they could not contemplate a Hamon victory. Realising that Hamon was badly let down by Valls and other former ministers, voters started changing their mind about what would be a “useful vote” to defeat the right and the extreme right. The more moderate socialist voters chose Macron tactically, and more recently, seeing that the Hamon ship was taking on water, more traditionally left-wing voters switched their allegiance to Mélenchon. The “Unbowed leader” unexpectedly became the last hope for leftists of all types to beat Fillon, Le Pen but also Macron. This last-minute support for Mélenchon does not mean full adhesion to his persona or programme, far from it. Jean-Luc Mélenchon’s incredible rise – which might now bring him all the way to the Élysée Palace – can be explained by his ability to grasp and mobilise the rebellious mood of the nation. But he has also been incredibly lucky in operating in a situation of near institutional and political collapse which has served him remarkably well. Whether Mélenchon wins this election or not, it remains to be seen how his “Citizen’s revolution” and the establishment of a 6th republic in place of de Gaulle’s 5th republic can be achieved without compromising with left-wing parties and trade-unions which, on a number of economic, political (laïcité, antiracism, gender-related issues) and geopolitical issues (Syria, Russia, the European Union) have strong reservations about Mélenchon’s style and politics.